While many of us can certainly understand Cassandra Austen’s desire to protect the privacy and personal life of her younger sister by destroying much of their correspondence, it is nevertheless a point of frustration for Jane Austen scholars and enthusiasts. Not only did all that letter-burning deprive us of valuable insight into the smaller details of Jane Austen’s life but also, and perhaps most importantly, it deprived us of the undoubtedly fascinating thoughts that accompanied them. 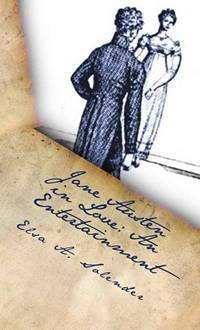 It is only fitting, then, that the narrator for the new novel Jane Austen in Love: An Entertainment, a fictional story inspired by known biographical details of Jane Austen’s life, is the protective but loving Cassandra who is imagined to have written this account of the life of her younger sister years after her death in an attempt to bring color to a life so persistently speculated and wondered about. The voice behind this imagined Cassandra is past president of the Jane Austen Society of North America, Elsa A. Solender. Released earlier this year by Amazon Digital Services as an e-book, Solender’s novel is actually an expansion of an earlier short story “Second Impressions” that was a runner-up in the first Chawton House Library Jane Austen Story Competition in 2009. An entertaining blend of fact and fiction – and, of course, filled with references to Jane Austen’s own novels – Solender gives narrative energy to the few known facts of Jane Austen’s life and, in doing so, imagines a series of events that takes its inspiration from actual letters and Jane Austen’s own popular novels. Beginning with Jane as a young, energetic, and delightfully precocious child and moving into her young adulthood, Solender examines some of the early “loves” in her life that have given profound shape and meaning to it – the love between her and her family, especially Cassandra, but also the love between friends, particularly Jane’s sympathetic and elegant friend Madame Lefroy and her fascinating cousin Eliza, the Comtesse de Feuillide. As the young Jane grows in years and intelligence, she becomes attuned to social intricacies that shape behavior and, in some instances, inspire potential subversions of it much to the dismay of society’s stalwarts but much to the delight of the young but intelligent observer. When society threatens to potentially alienate or pass judgment on those that Jane loves and admires, she learns the importance of balancing society’s expectations with one’s own personal beliefs and values. Moving into Jane’s adulthood, Solender visits more romantic love: the white coat-donning Tom Lefroy who amusingly reminds Jane of Henry Fielding’s title character in Tom Jones, her one-day engagement to kind but one-dimensional Harris Bigg-Wither, and the mysterious “Gentleman suitor of the seaside.” Like the novel itself, all of this is part-real, part-imaginary, and part-derived from Jane’s own later novels. While knowing that Solender is limited by the plain fact that Jane remained unmarried her entire life, she is still able to build an appropriate amount of tension regarding Jane’s love interests – what exactly attracts her to them? Who or what will come between them? What can we learn about Solender’s Jane from these imagined encounters? I found the novel to perfectly live up to its subtitle “An Entertainment” as it is very entertaining. More interested in character development than plot, this novel is rich with detail and extremely engaging. Solender’s decision to write this novel from the perspective of Cassandra was a smart one because it allows the tone and style of the novel to be appropriate to the time of the novel without having to be an exact imitation of Jane Austen’s. Plus, I have always been interested in the relationship between sisters (how interesting would it be to read a novel about Cassandra’s support but also jealousy of her sister’s success?). Solender’s Cassandra is sympathetic and the idea that she could inhabit her sister’s consciousness and relate events from this position is convincing. Moreover, Solender creatively uses Jane Austen’s own novels to inform and inspire events in fictional Jane’s life and you will enjoy, for example, how Mr. and Mrs. Austen are at times the Bennets, fictional neighbors are Mrs. and Miss Bates, and other references. If you enjoy fictional biographies, I highly recommend this book. Aia A. Hussein, a graduate of Bryn Mawr College and American University, pursued Literature degrees in order to have an official excuse to spend all her time reading. She lives in the DC area. Thank you, Aia Hussein, for another great review. You’ve made Elsa Solender’s “biography” sound most attractive! Beautiful review of a fascinating idea. Cassandra, in her own right was also a talented and witty writer. I enjoyed reading this review. I will definitely read this book. Thanks for the review. That’s an excellent point about Cassandra as a narrator. So many Austen spinoffs don’t quite catch her tone, so this will help me accept the book for what it is. I’m interested to discover the take on Cassandra being good support and jealous! No one knows you like your sister!! A very interesting take on Miss Austen, I’m looking forward to reading this “Entertainment”.